Methi Thepla is a very popular Gujarati dish made with flour, spices and fresh fenugreek leaves. It is soft flat bread which can be had anytime of the day. Here is how to make Methi na Thepla Recipe at home. Methi Thepla is a very popular Gujarati dish. It is basically a soft paratha with different kid of stuffings. A dough is made and it is then rolled into small flat breads which are cooked using little oil on a griddle. These theplas remain good for a couple of days and are a perfect choice to take along while traveling. These are also a great lunch box option as your kid can just roll and eat it without much hassle. Methi Thepla can be eaten as such or can be paired with Kerala style Ginger Pickle and yogurt or Dahi Ki Chutney. This Indian flatbread is considered very nutritious and good for digestion. In case you want to try something different, then theplas with lauki or bottle gourd and beetroot are also a must try. Superb to eaten with Adrak Wali Chai or any favourite beverage, trust me Methi Thepla tastes out of the world whenever eaten with something warm to slurrp with! 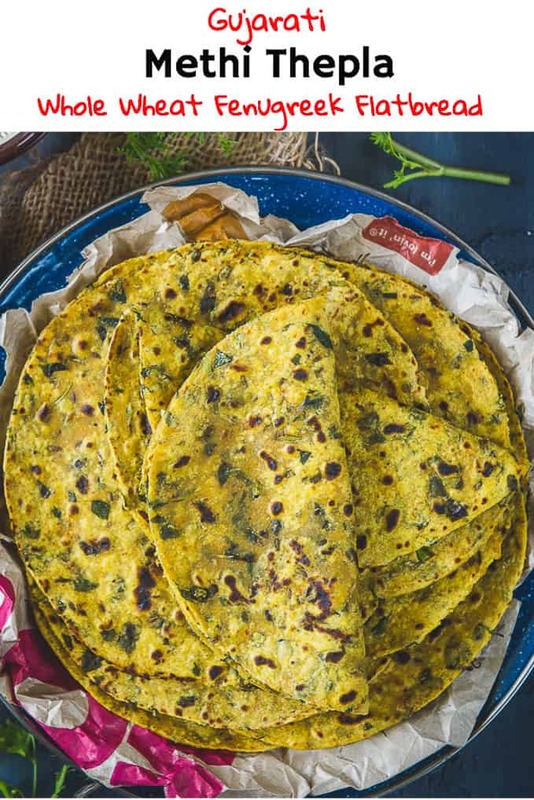 Thepla is Gujarati style paratha or flatbread made using whole wheat flour and is sometimes fortified with other flours like besan, bajra and jowar. Vegetables like methi or lauki are also added to it for enhanced taste and nutrition. 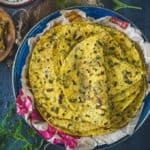 How to make Methi Thepla soft? To make methi na Thepla soft, curd is added in the dough. I also add besan in my thepla recipe which makes the thepla slightly crisp but if you want them really soft, skip adding besan in the dough. You can replace water with buttermilk to knead the dough to make it even softer. Which other flour can be used to make Thepla? Traditionally whole wheat flour and a little besan flour is used to make theplas. However some people also like to add a tbsp of Bajre ka Atta or Jowar ka Atta to their dough. It enhances the taste and also the nutritional value of the dish. 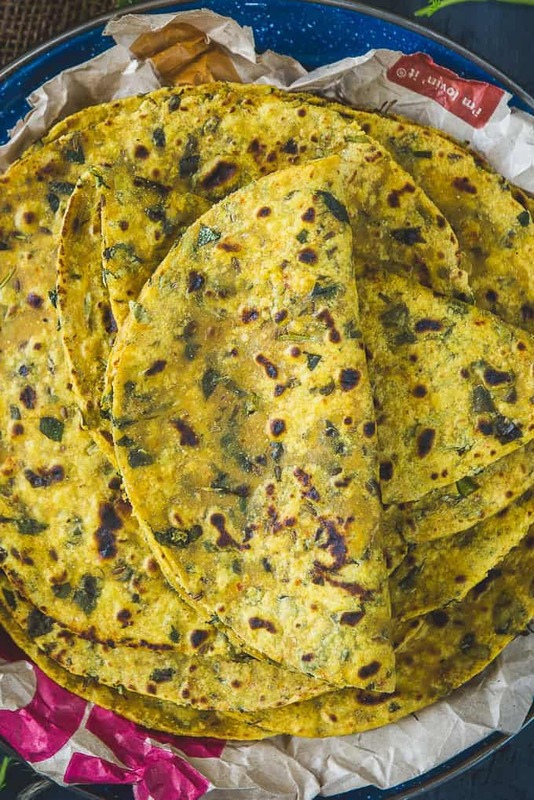 How to make Kasuri Methi Thepla? If fresh fenugreek leaves are not available, you can use kasuri methi to make the thepla. Use 3 tbsp of kasuri methi for every 2 cups of flour. How to make Thepla for travel? To increase the shelf life of the thepla, it is advisable to avoid adding curd while making these. Keep the rest of the ingredients same and skip the curd while making the thepla for travel. I also don’t add besan if I am making these to keep for long. Besan make the thepla a little crunchy which tastes when had fresh, off the stove. Mix all the ingredients except warm water and oil in a bowl. Mix nicely with your finger tips. Add very little water and knead to make a soft dough. Cover and keep the dough for 15-20 minutes. Add a tbsp of oil in the bowl and knead the dough again for a minute. Divide the dough into 10 equal balls. Dust and roll the balls to a 6-7 inch circle. Heat a griddle. Keep the thepla on the hot griddle and cook from both the sides till brown spots appear. Apply 1 tsp oil on both the sides and cook till spots darken and the thepla is cooked. Keep pressing the thepla with a flat spoon while it is cooking. 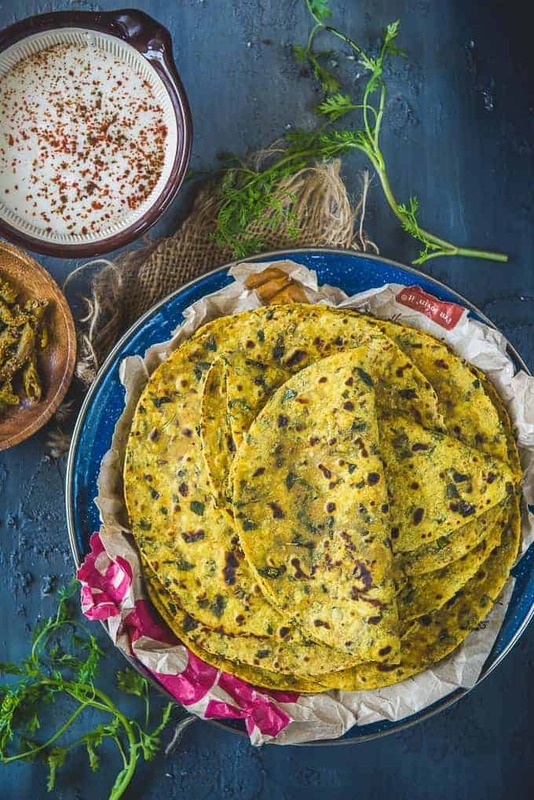 Methi Thepla is a very popular Gujarati dish made with whole wheat flour, chickpea flour, spices and fresh fenugreek leaves. Mix all the ingredients except warm water in a bowl. Mix nicely with your finger tips. Keep in mind the fenugreek leaves will leave water, so add very little water while kneading. Cover and keep the dough for 15-20 minutes. Add a tbsp of oil in the bowl and knead the dough again for a minute. Keep the thepla on the hot griddle and cook from both the sides till brown spots appear. Apply 1 tsp oil on both the sides and cook till spots darken and the thepla is cooked. Keep pressing the thepla with a flat spoon while it is cooking. If you are making the theplas to store and eat later, do not add besan to the dough. It will keep your thepla's soft for a longer time. But if planning to eat hot thepla's, besan will add a nice crunch.